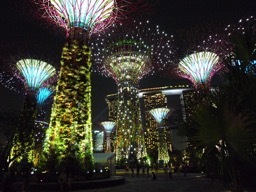 Earlier this year I stopped over in Singapore, home of the spectacular "supertrees" in the Garden by the Bay. The trip was a holiday, but I spent a good part of one day visiting Rudolf Meier's group at the National University of Singapore. Chatting with Rudolf was great fun, he's opinionated and not afraid to share those opinions with anyone who will listen. Belatedly I've finally written up some of the topics we discussed. Singapore has a rich fauna in a small area, full of undescribed species, so DNA barcoding seems an obvious way to get a handle on its biodiversity. Rudolf has been working towards scalable and cheap barcoding, e.g. $1 DNA barcodes for reconstructing complex phenomes and finding rare species in specimen‐rich samples https://doi.org/10.1111/cla.12115 . His lab can sequence short (~300 bp) barcode sequences for around $US 0.50 per specimen. 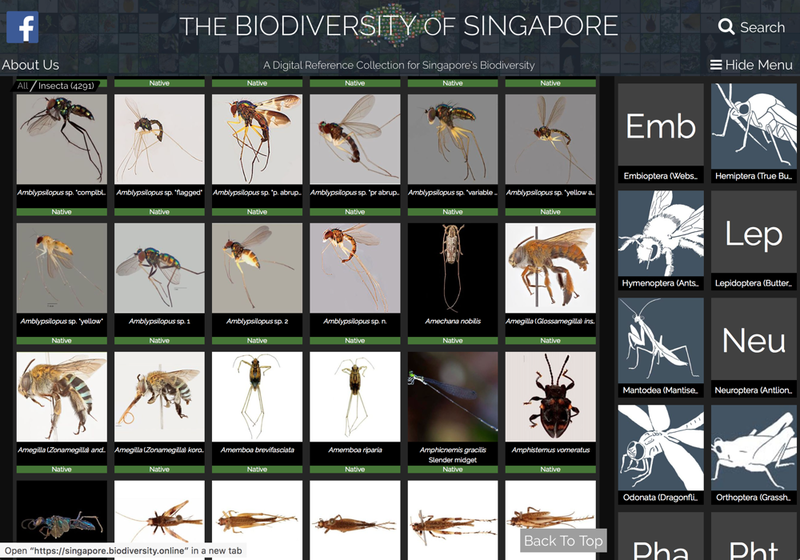 Their pipeline generates lots of data, accompanied by high quality photographs of exemplar specimens, which contribute to The Biodiversity of Singapore, a "Digital Reference Collection for Singapore's Biodiversity". This site provides a simple but visually striking way to explore Singapore's biota, and is a nice example of what Mitchell Whitelaw calls "generous interfaces". We could do with more of these for biodiversity data. One nice feature of regular COI DNA barcodes is that they are comparable across labs because everyone is sequencing the same stretch of DNA. With short barcodes, different groups may target different regions of the COI gene, resulting in sequences that can't be compared. For example, the 127bp mini barcodes developed in A universal DNA mini-barcode for biodiversity analysis https://doi.org/10.1186/1471-2164-9-214 are completely disjoint from the ~300bp sequenced by Meier's group (I'm trying to keep track of some of these short barcodes here: https://gist.github.com/rdmpage/4f2545eeea4756565925fb4307d9af6b. In the "old days" of colonial expansion it was common for taxonomists to write volume entitled "The Fauna of [insert colonised country here]". These were regional works focussing on a particular area, often motivated by trying to catalogue animals of potential economic or medical importance, as well as of scientific interest. By limiting their geographic scope, faunal treatments of taxa can sometimes be inadequate. Descriptions of new species from a particular area may be hard to compare with descriptions of species in the same group that occur elsewhere and are described by other taxonomists. It may be that to do the taxonomy of a particular group well you need to treat that group throughout its geographic range, rather then just those species in your geographic area. Hence faunas loose their scientific appeal, despite the attractiveness of having a detailed summary of the fauna of a particular area. DNA sequencing circumvents this problem by having a universally comparable character. You can sequence everything within a geographic region, but those sequences will be directly comparable to sequences found elsewhere. Barcoding makes faunas attractive again, which may help funding taxonomic research because it makes funding projects with a restricted national scope scientifically still worthwhile. As we discover and catalogue more and more of the planet's biodiversity we want to stick names on that biodiversity, and this can be a significant challenge when there is a taxonomic legacy of names that are so poorly described it is hard to establish how they relate to the material we are working with. Even if you have access to the primary literature through digitisation projects like BHL, if the descriptions are poor, if the types are lost or their identity is confused (see for example A New Species of Megaselia Rondani (Diptera: Phoridae) from the Bioscan Project in Los Angeles, California, with Clarification of Confused Type Series for Two Other Species https://doi.org/10.4289/0013-8797.118.1.93 by Emily A. Hartop - who I met on this trip - and colleagues), or can't be sequenced, then these names will remain ambiguous, and potentially clogging up efforts to name the unnamed species. One approach favoured by Rudolf is to effectively wipe the slate clean, declare all ambiguous names before a certain date to be null and void, and start again. This renders (or rather, resets) the notion of priority - given two names for the same species the older name is the one to use - and so is likely to be a hard sell, but it is part of the ongoing discussion about the impact of molecular data on naming taxa. Similar discussions are raging at the moment in mycology, e.g. Ten reasons why a sequence-based nomenclature is not useful for fungi anytime soon https://doi.org/10.5598/imafungus.2018.09.01.11, yet a another reflection of how much taxonomy is driven by technology. GBIF at 1 billion - what's next?